Paul Mison Photo, via Flickr. In order to (quietly) quantify this phenomenon, I created a new Twitter account @TechNewsQuietly, and used it to retweet every tweet from ten tech news sites that described a company, group, or individual as doing something “quietly.” When the same story was tweeted multiple times, I only included the first tweet. There are a few limitations to this method: Sometimes the tweet doesn’t exactly match the headline, and not every outlet has been tweeting every story for more than a few years. However, the 612 tweets that I collected data on were more than enough to perform some meaningful analysis. TechCrunch is far and away the heaviest user of “quietly” in headlines. 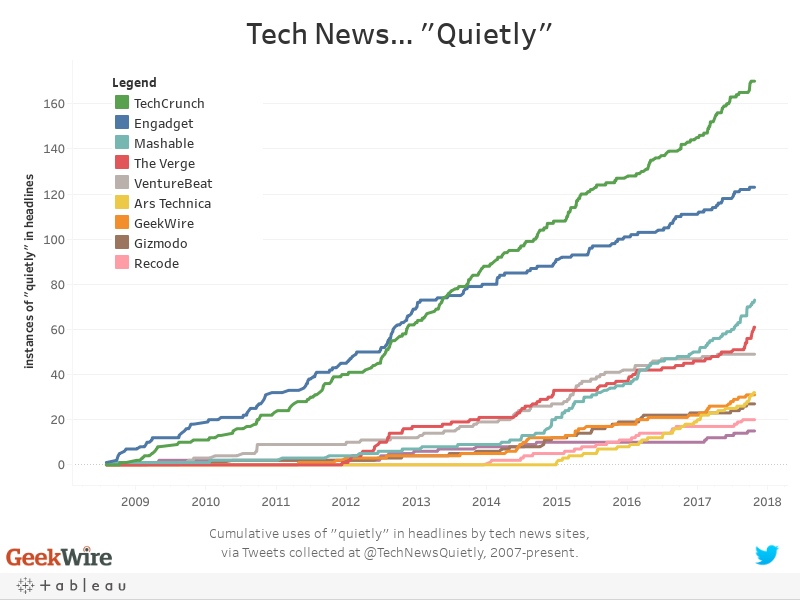 Averaged across the last five years, TechCrunch tweeted headlines with the word “quietly” nearly twice a month. The other two top offenders were Mashable and Engadget, who both used it more than once a month. The Verge, VentureBeat, Ars Technica, Gizmodo, Recode, and Wired all managed to keep their usage to less than once a month. And yes, even GeekWire is guilty, averaging one story every other month with “quietly” in the headline. Nearly two hundred different people or entities were reported to have done things “quietly” since the first recorded tweet in 2007. Some of my favorite things that were only once reported as doing something “quietly” include The Large Hadron Collider, the video game voice actor strike, an oil spill, and The Planet of the Apes series. It will be interesting to see whether or not tech news sites decide to tone down their usage of “quietly” in headlines after this analysis. If they do, I have a feeling that they’ll probably do it … quietly.